At three in the morning, I finally arrived in Siem Reap after the most hellacious bus ride – 27 hours and seven buses from Vang Vieng, Laos to Siem Reap, Cambodia. It’s a bus trip I wouldn’t recommend to my worst enemy. But I was more than happy to reach my destination, despite my zombie-like level of consciousness and the viciously haggling tuktuk drivers. But I made it! In an attempt to appease the tuktuk driver and find myself a suitable bed before dawn, I crashed at a pricey hotel with a fellow American (fortuitously found on one of the seven buses). The next morning we moved to the budget-friendly Siem Reap Central Hostel, only a few blocks from Pub Street. Central Hostel doesn’t come highly recommended by the stylish backpacking crowd, but for only $3 each a night, my random companion and I were happy with the simple accommodation. Now I was ready to explore the fabled ruins of Angkor Wat. The temples of Angkor Wat may not be the only allure of Siem Reap, but they are clearly the most wondrous. The sublime ruins scattered within the tangled labyrinth of the Angkor complex are the physical manifestation of a deeply spiritual and enterprising civilization. Angkor Wat and its environs are the remnants of the Khmer Empire and house its multiple capitals spanning from the 9th to 15th centuries. Angkor Wat has become the national pride of modern Cambodia and after visiting, anyone can see it’s worthy of its reputation. The temple complex is vast but you can peruse the ruins in a number of ways – by car, tuktuk, motorbike, bicycle or even walking. My budget allowed for walking or bicycling, so I opted for the $1/day bicycle that I rented from my guesthouse. When touring Angkor Wat, consider renting a bicycle – they’re economical and allow you to see the sights at your leisure, while tuktuk drivers can be pushy and a motorbike requires a costly deposit. Make sure yours comes with a working bike lock and a seat comfortable enough for you to ride on for long days. And most bicycles even come with a handy basket on the front! Now that I had my wheels, the next step was an entrance ticket. The ticket booth on the main road leading into the site has a few options for your visit – a one-day pass ($20), a three-day pass ($40), or the long seven-day pass ($60). Though the ticket is easily the most expensive purchase you’ll make in Siem Reap, Angkor Wat is worth the extra buck. Throw in for a three-day or seven-day pass and you won’t regret it. My traveling schedule allowed for a three-day pass and it was fair amount of time to get lost among all the temples. So with my three-day entrance ticket, I hopped on my bike and meandered through the tree-lined avenues with my new friend. We spotted Angkor Wat on our way in and raced over to start our explorations. The temple was as overwhelming as everything had described and intricately etched with mythical bas-reliefs and the well-known apsaras, or celestial nymphs. We rambled aimlessly through the galleries and towers and caught snatches of information from random tour guides. Our first day was short and the overcast weather made for some lazy exploring. We found a relatively abandoned monument behind the main temple and sat there for a bit in the rain, soaking in all the magic. The second day of my bicycling tour I cycled the Grand Circuit of the Angkor Wat grounds, totaling a long and sweaty 35 kilometers for the day. The highlight in the morning time was the Bayon temple, harbored within the greater Angkor Thom site. The many esoteric faces topping the towers are thought to represent a Buddhist deity or the ancient king Jayavarman VII. To enjoy the tranquility on the temple top, it’s best to go early to avoid the gaggles of tourist groups. After winding nonchalantly down the twisty lanes and trekking through numerous temples, we picked a tiny corner of the Phnom Bakheng to enjoy the sunset. The temple was packed with people trying to capture their own sunset snapshots – so if you’re looking for something a little more peaceful, I’d suggest a more remote temple to see the view. It was sadly a wee bit cloudy, but still a relaxing end to an adventurous day. A few drinks back on Pub Street also helped with the bike aches. I recommend Viva for cheap margaritas and decent Mexican tacos. Day three marked the last day of touring and the most beautiful weather. We rose before dawn to bike back to the Angkor and catch the obligatory sunrise above the temple – one of the most beautiful things to see in Cambodia. Despite the huge crowds of people, who obviously had the same idea as me, the sunrise was a magical site and I definitely don’t regret waking up so early to catch a glimpse. After having a quick coffee, my friend and I split ways for the day to traverse the remaining temples alone. I visited the Bayon temple again to indulge in some light reading while lying against the trees and later, continued on the Small Circuit of Angkor Wat. I skated past serene monks and packs of monkeys and wandered upon the ruins of the Ta Prohm temple. 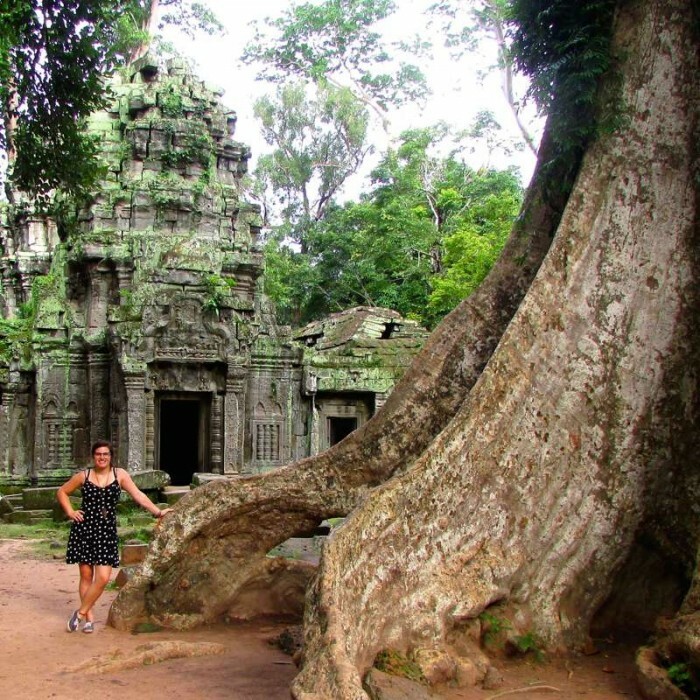 One of the most notable of the Angkor temples, Ta Prhom is overrun with tree roots and moss-covered stones. There were no tours passing through when I happened upon the site, so silence reigned through the jumbles of rocks and empty anterooms. The mammoth trees in and around the temple were most curious with their roots knotted between the stones but seemed to fit perfectly there at the same time. The end of the day I clocked 27 kilometers and a grand total of 70 km for the 3 days of bicycling the temple complex. If you decide to undertake the three-day tour by bicycle, make sure you check your map and prepare for a long road ahead. The whole of Angkor is an expansive complex, but I found it easy to weave through all of the major monuments and still find time for snack breaks and reading. 1. Wear or bring an extra set of modest clothing, i.e. long shorts, capris, pants, or a long skirt plus a scarf and a shirt with sleeves to the elbow. Some temples are still hosting practicing monks and require visitors to wear modest clothing to enter. 2. A good camera to catch that epic Angkor Wat sunrise. Or Go Pro with a head mount might be a good option as well! 3. Monopod to make selfies. 4. Your Angkor Wat map marking the Small and Grand Circuits, which is freely available at most guesthouses. 5. A bike light or flashlight if you have one handy for riding back to your guesthouse after sunset. 6. A big, big water bottle! 7. Sunscreen for body and face is a must if you are touring in the daytime. 9. A hat and sunglasses. 10. Some sanitary wipes or tissues for those unequipped toilets. 11. A good book or journal if you plan to lounge around. 12. Your own snacks when you’re out and about all day. 13. Some extra cash for the overpriced food and souvenirs if you can’t resist. 14. And don’t forget your ticket!